Towards the end of Princess Diana’s marriage to Charles, just the mention of her name was enough to send her father-in-law into a tirade. If she’d had enough of the Royal Family, she could get out and stay out, raged Prince Philip. The story of Diana’s turbulent years at the heart of the Royal Family is now familiar to most people. What is far less under- stood, however, is how the Queen and Philip viewed their troubled daughter-in-law, and how they tried as best they could to help her. After Diana started appearing on front covers around the globe, she carved out an ever more prominent place for herself within the Royal Family. But Philip didn’t like it. Nor, in her milder way, did the Queen. Although she regarded Diana as hard-working, she doubted if the princess had any real sense of commitment to the institution that had elevated her to public prominence in the first place. She was also deeply suspicious of Diana’s Hollywood-type glamour and the way she would use it to manipulate public opinion. Yet the Queen is softer than she can appear. When it became clear that Diana had given interviews for Andrew Morton’s infamous biography, which exposed the misery of her marriage in searing detail, her mother-in-law couldn’t bring herself to condemn her. 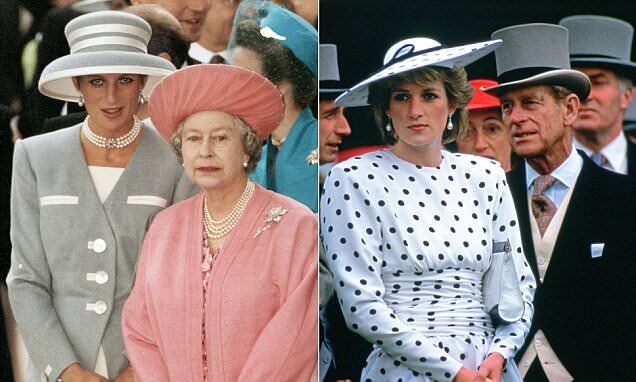 She told Philip that she had sympathy for Diana’s predicament — but this didn’t go down well. In truth, he was incensed. As always, Philip articulated his views forcefully and accused the Queen of ‘procrastinating’ on the question of whether Charles and Diana should divorce. Predictably, Anne and Edward — the closest to him of their children — agreed.